In Paris of the 1960’s, Michel Dufrenoy wins an award for a verse he’s written in Latin. The audience is amused and his family is put out. In this society everyone is obsessed with technology and life is only to be lived efficiently. NOTE: This story was rejected for publication by Jules Hetzel in 1863 when it was written. In 1989 Jean Verne (grand-grandson of Jules Verne) was cleaning out the family house when he discovered the manuscript in a trunk. The manuscript was turned into a novel that was published in 1994; it was immediately a bestseller in France. In truth the whereabouts of the manuscript were known for many years, the story of the discovery was created as a marketing ploy. Translator: Richard Howard. Introduction: Eugen Weber. New York: Random House, 1996. xxvii+223 pages. The saga of the discovery of the manuscript of Paris au XXe Siècle in a Verne family safe, and its publication in France in the fall of 1994, were widely chronicled all over the world. In the United States, at the time, the story was told on network news shows, National Public Radio, and periodicals from the New York Times to the National Inquirer, as well as such scholarly journals as Science Fiction Studies (Arthur B. Evans, “The ’New’ Jules Verne,” SFS 22:35-46, #65, March 1995). Paris au XXe Siècle was quickly translated and published in many countries in the intervening two years, although the English translation has been one of the slowest to appear. The sensation created by the novel can be noted by the fact that it has already been adapted into a stage play, in the Netherlands. Hetzel’s stroke of genius was in urging Verne to wed science fiction with the plot formula of an adventure story, a marriage that dominated the genre into modern times. For instance, Five Weeks in a Balloon told not only of a new aerial navigation device, but its use in a voyage of discovery across Africa. Instead of Paris au XXe siècle, Voyage au centre de la Terre [Journey to the Center of the Earth] became Verne’s second full-length published novel. Journey to the Center of the Earth utilizes the same pattern as Five Weeks in a Balloon : the chronicle of an incredible quest for the Earth’s core, a trek that is simultaneously an initiatory, first-person account of a youth’s coming-of-age. The other work-in-progress which Hetzel accepted at the time, called Voyages et aventures du Capitaine Hatteras [Journeys and Adventures of Captain Hatteras], an imaginary account of the first trip to the North Pole, also fit the generic melding that Hetzel sought. Paris in the Twentieth Century was not the only early Verne work rejected by Hetzel because it did not fit the genre he was hoping to establish for a series of “Voyages Extraordinaires.” Voyage à reculons en Angleterre et en Ecosse [Journey to England and Scotland] (translated in 1992 as Backwards to Britain, another recently discovered Verne text that Hetzel had turned down, indicates what the addition of adventure meant for Verne’s narratives. Journey to England and Scotland is a dry, mundane travelogue, without the combination of an adventurous plotline that would make such later Verne works as Le Tour du monde en 80 jours [Around the World in 80 Days] into enduring classics. Although Verne internalized many of Hetzel’s strictures, as late as 1870, after seven popular “Voyages Extraordinaires,” Hetzel would reject l’Oncle Robinson [Uncle Robinson] (published in France in 1992 and not yet translated into English), which Verne reconceived as L’Ile mystérieuse [The Mysterious Island] and several other later castaway stories. 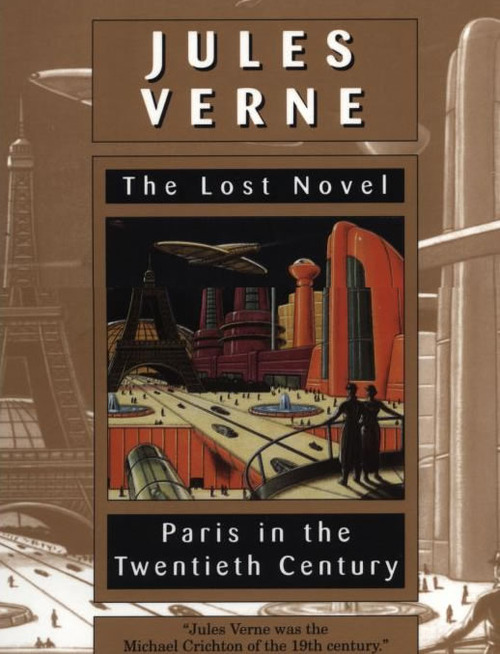 Paris in the Twentieth Century is billed on the cover as “the lost novel;” in fact it is only the latest “lost” Verne work to surface in the last decade. In addition to Journey to England and Scotland and Uncle Robinson, a third novel has been published in France, Un Prêtre en 1835 [A Priest in 1835], written before Verne was twenty. A number of short stories and novelettes have also been discovered and published for the first time. Many of the novels issued after Verne’s death turned out to have been rewritten and in some cases created by his son Michel, and the original texts by the senior Verne have also been recently published. Paris in the Twentieth Century has earned more publicity than these others simply because it is the only book never before published in any form to be science fiction, associating the author with the genre with which he is best known. Weber’s meandering, unfocused piece contains a number of factual errors, and contributes little context or understanding of the novel. For instance, Weber fails to understand that the giant ledger at which Dufrénoy works is not a prophecy, but a symbol of the oppressive dominance of commercialism. He seems unaware that the “Voyages Extraordinaires” are full of social satire, with the most relevant counterpoint to Paris in the Twentieth Century being L’Ile à hélice [Propeller Island], another story of an apparent municipal utopia gone awry. There are also such minor errors as giving the date of Verne’s death as 1904 instead of 1905, and describing Georges Méliès’s version of Verne’s lunar novels “Le Voyage dans la Lune” [“A Trip to the Moon”] (1902) as “one of the first French films made,” when in fact France was already a world leader in filmmaking throughout the 1890s. -- Brian Taves, Books in Review “Jules Verne’s Paris in the Twentieth Century” Science Fiction Studies, XXIV #71 (March 1997): 133-138.